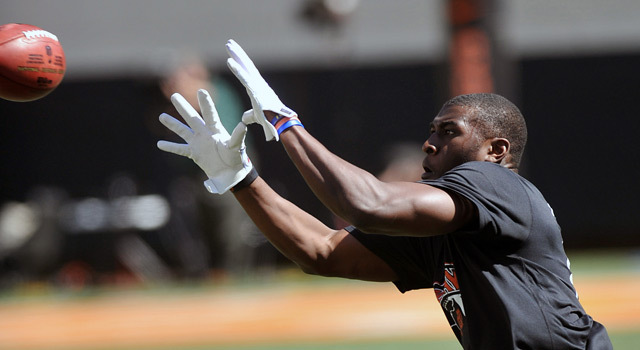 Published: April 5, 2012 at 04:11 p.m.
After a so-so combine, Justin Blackmon solidified his top-10 status with a stellar showing at his pro day. NFL scouts and general managers travel to campuses all over the country during the fall to evaluate how prospects perform on Saturdays. They hit those schools for a second time (... or third ... or fourth, depending on the schedule) during March and early April for pro days, where players perform the same athleticism tests NFL fans witness at the NFL Scouting Combine in Indianapolis at the end of February. Some players see pro days as a second chance to improve a result from Indy, or perform a drill they chose not to do the first time around. You'll notice that most of the players listed here who earned a second look from scouts with strong pro-day performances are wide receivers. Improvements in the almighty 40-yard dash and other athleticism tests are as important to that position as they are to any during the evaluation process. Edwin Baker, RB, Michigan State (5-foot-8, 203 pounds): Baker had a tough junior season, getting benched midway through the year due to inopportune fumbles and depth at the position. Beating the 4.4 mark on one of his pro-day 40s, however, reminded scouts of how good he looked while running for 1,201 yards and 13 scores in 2010. Justin Blackmon, WR, Oklahoma State (6-1, 215): The two-time Biletnikoff Award winner as the nation's top receiver faced questions about his straight-line speed coming into draft season, especially when he didn't run at the combine. But hitting mid-to-high 4.4's on scouts' watches quieted any concerns and secured a spot in the top 10. Greg Childs, WR, Arkansas (6-3, 219): Childs took full advantage of the nine days separating his combine workout and the Arkansas pro day, running 40s in the low 4.4's after posting an unofficial 4.50 in Indianapolis. He also increased his vertical jump four inches (40.5 inches) and his broad jump two inches (10-foot-7), potentially getting himself back into the top 100 after spending most of the fall trying to return to full strength following a 2010 knee injury. Alshon Jeffery, WR, South Carolina (6-3, 216): The Gamecocks' star receiver is the favorite to come up with the pigskin in any jump-ball situation, but scouts weren't sure if he had enough straight-line speed to separate from NFL defenders. Breaking the 4.5-second barrier in his 40-yard dashes on campus alleviated their worries. His 33-inch arms and quick shuttle times might also help teams ignore his decrease in production last fall (88 receptions for 1,517 yards in 2010; 49 for 762 in 2011) and put him back in the first-round conversation. Leonard Johnson, CB, Iowa State (5-10, 196): Johnson's 4.71 40 was the worst among all cornerbacks at the combine in February. The mid-4.5 times he posted on campus two weeks ago weren't blistering, but at least they quieted some talk about his speed and got teams focused on the solid game tape portending a Friday-night selection. Rishard Matthews, WR, Nevada (6-2, 209): Matthews quietly finished in the top 10 nationally in receptions and receiving yards, despite missing the season finale (and subsequent all-star games) with a sprained knee. The smooth runner put up 40s in the 4.44-4.48 range at his pro day after being credited with a 4.6 at the combine and looked very good catching passes. Nick Toon, WR, Wisconsin (6-2, 215): The son of 1985 first-round pick Al Toon greatly improved his 40s when back in Madison, timing in the 4.38-4.41 area after being hand-timed in the mid 4.5's in Indy. His 10-foot-10 broad jump would have rated second among receivers at the combine and he also increased his vertical jump from 37.5 to 39 inches. Despite his injury history, Toon might have found a place late in the second round with this performance. Kendall Wright, WR, Baylor (5-10, 196): His 4.61 official combine 40 time raised eyebrows, since scouts pegged him for a "4.4 guy" based on his game tape. (His 1,663 receiving yards this year ranked third in the country.) He met those expectations at his pro day, putting up times of 4.44 and 4.41 seconds. As a result, he'll probably join his Heisman Trophy-winning battery partner Robert Griffin III in the first round.